At the end of the Bronze Age, a series of invasions threw the Near East into political turmoil, severely weakening the established powers there. Thus at the start of the Iron Age, the old powers that had ruled over the Levant such as Egypt and the Hittite Empire, were no longer strong enough to control the region. This political vacuum was filled by three main groups; the Philistines, the Phoenicians, and the Israelites. The origin of these three peoples is not clearly understood. The Philistines were one of the 'Sea Peoples' that had invaded Egypt at the end of the Bronze Age and then settled on the coastal plain around the area of Gaza. The Philistines came from somewhere in the Mediterranean, many scholars have suggested somewhere in the Greek World. The Phoenicians were the Iron Age peoples that lived in the coastal area roughly corresponding to modern Lebanon. Some scholars have suggested that the Phoenicians may have migrated to the region from elsewhere, whilst others argue that their culture simply evolved from the Bronze Age Canaanite peoples of the same region. According to the Hebrew Bible, the Israelites were a confederation of 12 tribes sharing a religion and language. They had originated in the Levant but subsequently moved to Egypt where they were persecuted and enslaved. At the end of the Bronze Age, the Israelites, under the leadership of Moses, migrated back to their homeland to escape persecution in what is referred to in Biblical texts as the 'Exodus'. Upon arriving in the Levant, the Israelites were supposedly commanded by their God to wage a war of annihilation against the Canaanite peoples that lived there. (Deuteronomy 20:17) (See map 1- The Israelite Conquest of Canaan) Most of the cities that were conquered were totally destroyed and the inhabitants, including the women and children, were all slaughtered. (Deuteronomy 3:1-7, Joshua 10:28-45) Though in some circumstances, such as the war against the Midianites, the virgin girls of the vanquished were kept as plunder. (Numbers 31:10-18) After the conquests, the Canaanite lands were divided amongst the 12 tribes of Israel, supposedly by God himself. (See map 2- the Twelve Tribes of Israel) However it should be stressed that there are no contemporary non-Biblical accounts of the Exodus story, and whilst there is archaeological evidence for the destruction of many Canaanite Cities during the Bronze Age Collapse, other cities mentioned in the Hebrew Bible were not destroyed in that period, and Jericho was not even inhabited at that time. 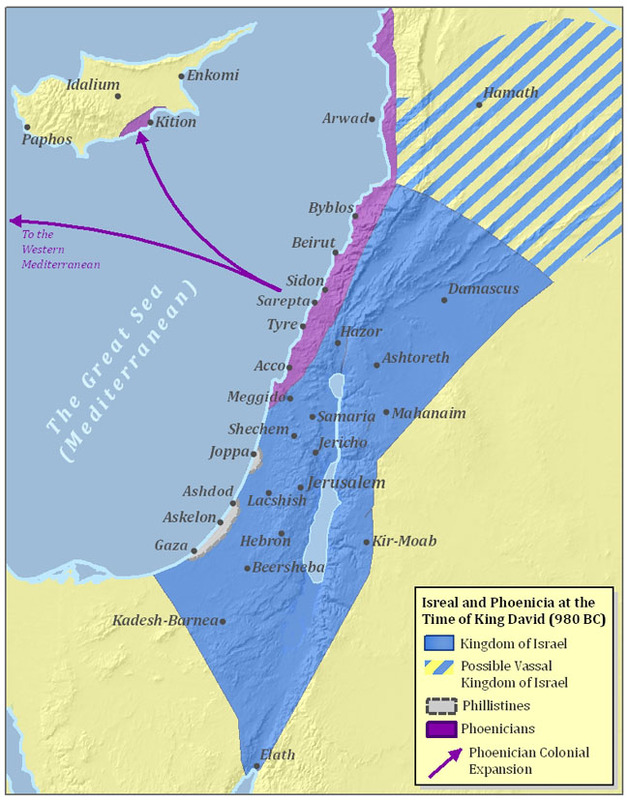 By the 11th Century BC, King Saul had managed to unite most of the Israelites into a single Kingdom (see map 3 - 1010 BC). King Saul died fighting the Philistines and was succeeded by his only surviving son: Ish-bosheth. However, the tribe of Judah succeeded from the rule of the House of Saul by proclaiming David as its king, and war ensued. (2 Samuel 2:12) David eventually prevailed against Ish-bosheth and was pronounced the new King of Israel. (2 Samuel 3:1) David then went on to conquer many of the surrounding areas and carve out a large empire, Biblical texts state that his Empire reached as far as the Euphrates River, which would have included the area to the North of Israel known as Hamath. (See map 4 - 980 BC). David was succeeded by his son Solomon who enjoyed a long and prosperous reign, having 700 wives and 300 concubines according to the Old Testament (1 Kings 11:3). The Kingdom of Israel was however unstable due to it's disparate tribal origins, and it began to disintegrate quickly. During the reign of King Solomon, Damascus revolted and became independent. (See map 5 - 940 BC). Then, after Solomon's death, the Kingdom was divided into the northern Kingdom of Israel, and the Southern Kingdom of Judah. (See map 6 - 900 BC) Both of these Kingdoms would be conquered by the Assyrians in subsequent centuries. The traditional interpretation of the Bible is that the Israelites always worshiped one God: Yahweh. However there are a number of verses in the Bible where Yahweh is described as the greatest of Gods (Exodus 15:11, Exodus 18:11). Archaeological evidence also shows that the Israelites worshipped many Gods as late as the 8th Century BC. There is now a growing consensus among scholars that Yahweh gradually developed from one of many Gods, to the greatest God, and finally to the only God as the religion of the Israelites evolved. Contemporaneous with the Kingdom of Israel was the golden age of the Phoenician merchant city states. From their bases along the coast of Lebanon, the Phoenicians began establishing trade colonies in Cyprus, and then further afield, in North Africa, Spain, and the Islands of the Western Mediterranean.